Last month I was extremely lucky to be able to attend The Allergy UK Annual conference, the first one they have run but hopefully the first of many. The quality of speakers was excellent and I learnt so much my poor brain was aching afterwards and my note pad is bursting with almost legible notes. It was an early start on a beautiful sunny Saturday morning but well worth the effort. It took place at Guys and St Thomas’s Hospital in Westminster which is an excellent venue packed full of allergy specialists, parents of allergic children and allergy types like myself. It was actually a treat to meet other adults with loads of allergies who are also getting more and more each year, just like me. I am still a freak but at least I know I am not alone! 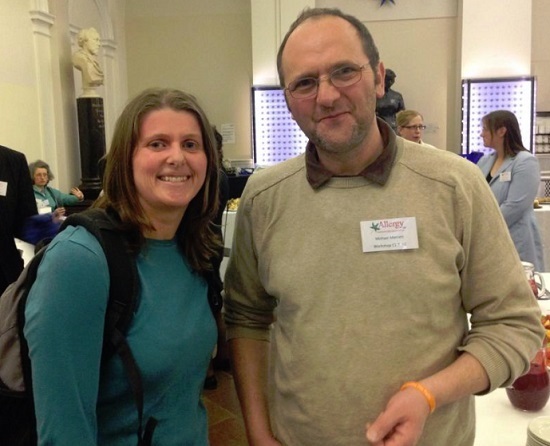 Me at the Allergy UK Conference 2014 with Michael Merrett of Allergy Essex. So here, very quickly, in a nutshell (not a real one, they are not allowed in this house… geddit? ), are the 5 main things I learnt at the conference. – We heard about studies into children who drank pasteurised, non pasteurised and raw milk and in all the research those exposed to pasteurised milk were far more likely to develop an allergy to milk. Raw milk contains 10,000 more good bacteria than it’s poor cousin pasteurised milk. Disease and infection spread in milk such as small pox are the reason most of our milk is treated but is the dead milk, with hardly any goodness left in it really good for us? One study by Perkin & Strachan published in the Journal of Allergy and Clinical Immunology (JACI), 2006 documents these research findings. – The map showing levels of Vitamin D from the sun shocked me. Here in the UK we are living under a black cloud where it is almost impossible to get enough vitamin D from exposure to the sun even if you worked outdoors. Vitamin D is also readily available in oily fish and Cod Liver oil as well as other foods. Add this to the fact that we are all terrified of skin cancer and slather on the sun screen at every opportunity our skin probably gets hardly any exposure to natural vitamin D at all. Try to get 20 minutes in the sun every day before slapping on the sun screen, it’s good for you! I’ve written about why Vitamin D is so good for you if you have eczema and allergies here. If you want to read more about this there are a few studies which also looked at Vitamin D and asthma; Brehm et al 2009, Searing et al 2010 and Sutherland et al 2010. These showed that a person with asthma was 5 x less likely to be hospitalised with asthma if they had high levels of Vitamin D in their diet. – Those of us with allergies tend to downplay the importance of the other things we get, like asthma, hay fever or eczema. Hey they’re just not as life threatening, they’re not the problem, it’s all about the allergies and the impact they have on our lives. But this is very dangerous thinking, I am guilty of thinking this too, especially with asthma, which, if not kept under control and well managed can mean the difference between a bad or fatal anaphylactic reaction and mild one. Asthma is viewed more seriously than allergies under the NHS and the asthma care most people get is often much better than an allergy support or treatment. I have regular visits with my asthma nurse and value the importance of the preventative asthma drugs. I hate taking them but they transform my life from a wheezing frustrating existence to a normal one. They are miracle drugs for me really. My worst anaphylactic reactions, where I have had to use an auto-injector and go to A&E have all included an asthma attack. It is vital to keep fit and healthy, asthma improves, eczema improves and allergic reactions are less dangerous. If you have asthma and either don’t think it’s controlled, don’t know how to use your inhaler, make an appointment today! I learn something nearly every time I go to the asthma nurse, treatments change, techniques and advice changes too. I cannot stress enough how important this is. I discovered from a nurse only about five years ago that I wasn’t actually using my inhaler properly. I was getting some drugs into my system but not as effectively as I could have been. We all develop bad and lazy habits from time to time so it’s worth it for a twenty minute consultation, won’t cost you anything and could massively improve your health. – Is there a link? A study by Wickenset et al in the Journal of Allergy and Clinical Immunology, 2008 examined the different types of probiotics and interestingly some worked better than others. Bifidobacteria has little of no effect but Lactobacillus seemed to mean people were less likely to develop eczema, however there didn’t appear to be any link with allergies. I am convinced that gut health has a direct link to out brain and other parts of the body so surely ensuring you have a healthy family of bacteria is going to help in many different ways. I take a probiotic (when I remember) and am sure it helps with my intolerances, though probably not with the allergies. My skin is much much better at the moment but I do so many little things to help that it’s impossible to pinpoint which is the key beneficial ‘thing’ or perhaps whether the cumulative impact of many healthy habits and changes are what makes the difference? Anything that can show eczema whose boss and is affordable is worth trying in my book. Always read the labels if you do a probiotic though as some can contain allegens. Something which has always made me feel a bit weird just thinking about spraying anything up there. Urgh! So here very briefly is how to use a nasal spray. Clear your nasal passage first as it often makes you feel like sneezing afterwards. If you’re using a saline wash, lean over a basin, spray up one nostril and it will naturally flood back down the other one. And for using nasal sprays, which should not be used all the time, some are really not good for you so make sure you have a proper prescribed product if rhinitus is causing you discomfort. Don’t tip your head back or it will just go down your throat where it is not needed, tip your head forward, squirt up one side while holding other nostril closed. Wait 30 seconds and do the other one. Over the counter decongestants can actually be worse for your health so speak to your doctor about which product will be best for you and get something prescribed. I found that a nasal spray really helps my hay fever, despite the fact that it is usually my eyes that are worse and not my nasal passage – the allergens are breathed in through your nose and then go on to effect your eyes so whilst some can still land directly in your eyes from the air, a nasal spray should help both nose and eyes. Try it and see. Works for me. We had a very detailed lesson on what actually goes on inside us when an allergic reaction is taking place and it’s a right battle ground. Our immune systems are fighting so hard, they are completely over reactive but they can’t seem to help themselves. They keep us alive by fighting viruses and illnesses and are very effective, sending the right soldiers to the right bit to aid healing and recovery. IgE wotsits kind of connect to the mast cells when they detect an allergen in the body and then the histamine gets involved. I can’t explain it very well and would love to study this all in more detail. Louise of NutMums shares her experience of the day and a beautiful drawing of what is happening when we have an allergic reaction here in, What I learned at the Allergy UK Conference 2014. Her write up of the conference is far more detailed than mine and well worth a read. There was so much more, so many interesting presentations and some very needed networking with people just like me. There was too much to mention here but it will be the inspiration for many more blog posts I’m sure. So we don’t have any miracle cures or magic bullet answers to the big question, Why do we have allergies and how can stop getting them? It is still a mystery but there is a lot of research going on and possibly some new drugs on the horizon which might help us. I hope that more studies are conducted into treatments like helminth therapy, oxygen chamber sessions and faecal transplants, all of which have been documented to have helped people with all sorts of inflammatory conditions, but which the medical profession shun, ridicule and refuse to even discuss. There has to be an answer out there. I refuse to give up and education and learning is the way to go. Thanks to Allergy UK for an excellent conference. Put me down for a place next year!